This will give you a basic outline of the different phases of CBS home construction here in Cape Coral and Fort Myers Florida. Please be aware that the builder / contractors may differ on scheduling construction phases due to personal preferences, sub-contractor schedules and the availably of building materials. We would like to make clear, that Tamure is not a builder or contractor, Tamure is a licensed real estate corporation in the state of Florida. We work as single agent representing only buyers in real estate transactions at no additional costs to the buyer. The information on this page is provided for potential clients that maybe interested in building a new home or remodeling a resale home. While building a new CBS home is both exciting and rewarding, it also demands that a buyer be fully prepared and committed to the challenge. Our goal is assisting you in building the finest quality CBS home possible and providing you with a positive experience in the process. Please see the Buyers section to the left for a list of our services. 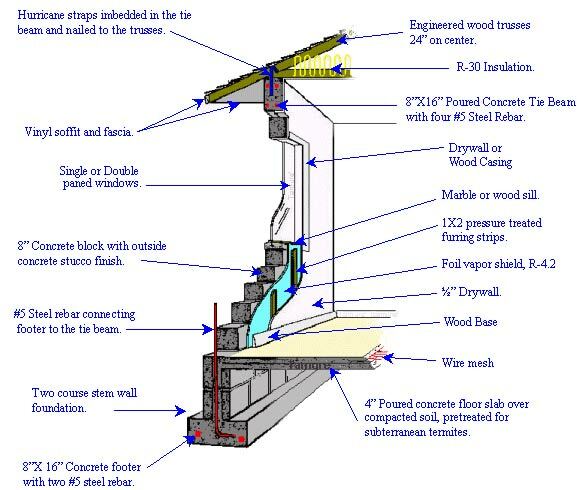 These are the different phases of construction for a typical concrete block home in Southwest Florida. We do this at no additional cost to you.